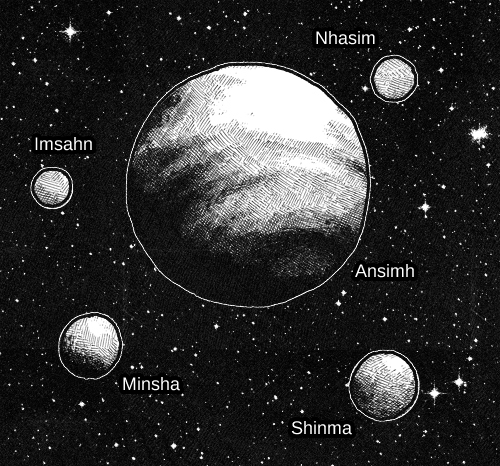 Zoonbats takes place in the planetary system of Ansimh, which has four moons: Shinma, Minsha, Imsahn, and Nhasim. The main characters are from the city of Haquel, state of Disan, on the continent-country of Sil, on the moon Shinma. (Although, as the story begins, Wayne Molly is traveling in the Northern lands, heading south from Ikuma along the coast in the state of Ruma.) The two continents of Shinma are dotted with countless craters, some of which are now host to huge lakes, suggesting that at one time in history the moon had no atmosphere. There are vast plains and multiple mountainous regions. The continents move fairly rapidly on highly active tectonic plates, leading to frequent mild temblors and occasional intense earthquakes that have dictated the positioning of most major cities. One of Shinma’s most distinctive features is that it is orbited by a floating city, Niana. Niana travels on a set schedule that repeats every two weeks, stopping for a day at a time over some of the major cities of Sil and the moon’s other continent-country, Zom. Niana is a tourist destination in itself, as well as the primary port city between Shinma and the rest of the planetary system. The technology that powers Niana is from a long-ago era, and is said to be not fully understood by present-day engineers and/or too costly to duplicate. Its energy source is generally undefined and the subject of a lot of speculation. Minsha is the other populated moon, and generally the more wealthy and technologically-advanced in comparison to Shinma. However, this edge is primarily a result of fairly recent trade policies and has not resulted in any technology as dramatically advanced as Niana. Ansimh is the site of the planetary system government and associated trade organization that maintains a strong influence on the affairs of the moons, although each moon has its own independent government. Although Ansimh is obviously quite a bit larger than its moons, its population is not much greater, and its cities are concentrated in small areas with vast expanses of wilderness, primarily desert, forming the majority of the planet. 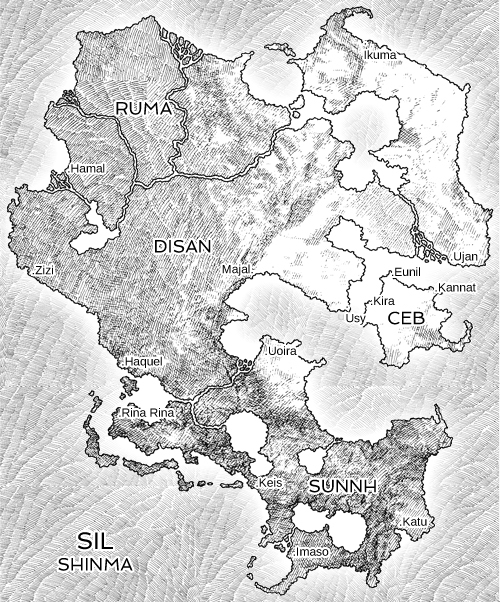 Imsahn and Nhasim are generally unpopulated and have been designated primarily as wildlife preserves, although they are sometimes rumored to be used as havens for smugglers and outlaws. The moons and planets are involved in complex orbits that result in a huge variety of formations visible from each vantage point, and as a result each culture tends to view skywatching as an engaging pastime and subsequently places its own unique interpretations and customs on the various formations. Some of the formations are common and frequent, while others occur more rarely. Silnai (the people of Sil) culture places a strong emphasis on the oral tradition. Life is generally regarded as a story to be told and retold, and through the practices of storytelling and active listening, the Silnai derive meaning and enjoyment from life. There is a common belief in spirits, ghosts and transdimensional beings, most of whom are known as residents of various regions, although there are many people who haven’t personally encountered them. On the other hand, some of these beings are said to live among the people and pass as mortal folks. There are a number of hybrid human-animal species, whose origins are so far in the distant past that, like Niana’s, they are unclear. An immense blank period of history exists, and even its cause is generally unknown.